Any mention of bike riding has been sure to throw Miriam into a funk the past several months (maybe even years). She finally figured out how to ride a tricycle and probably would have been happy to ride that for the rest of her life, except that I told her it was time to pass it on to her brother (who, for the record, is as inept as both his sisters were in this department and cannot figure out how to pedal the silly thing*). A woman in our ward gave us a balance bike (last year) which Miriam refused to balance on. Oh, she'd walk around with it between her legs, but she'd never actually try coasting on it. I figured it was too small for her, so I took the pedals off one of our bigger bikes so that she could try balancing on it without the pedals getting in the way. She wouldn't. There's been a lot of sulking, a lot of pushback about acquiring this particular skill. Today, however, we found ourselves with a relatively cool afternoon and nothing in particular to do, so I loaded up the kids and their bikes and we headed to a park that has a nice paved trail. 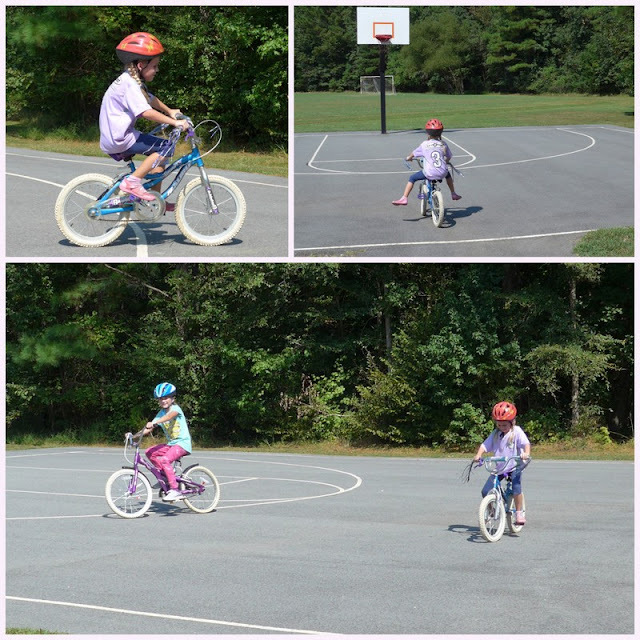 Miriam hopped on her bike and actually tried coasting—pushing off and letting her bike carry her—right there in the parking lot, and then jumped off and said, "I'm ready! Did you bring my pedals?!" I happened to have them tucked away in the diaper bag, so I put them on and, after a few attempts, Miriam was off riding her bike like a pro! She fell several times (I think she counted eight falls) and came away with a few scrapes, but overall she was very pleased with herself. Also, she can't quite steer yet and seems magnetically drawn to collide with any potential obstacle, even if the statistical odds of hitting that obstacle are slim to none. For example, there was a lone garbage can in an otherwise open area. She hit it. That basketball pole? She hit it (several times). She ran into a couple of trees—not trees in the woods (though she veered off into the bushes a few times as well) but random shade trees by the soccer field. It was quite comical to watch, truthfully. "How are you doing this?!" I asked her at one point (I think after she ran into the basketball hoop pole (again)). "You have all the room in the world to miss that pole but you keep running into it!" Instances of running into things were not tallied with "falls" because she often wouldn't fall off her bike when she crashed; she'd just come to a screeching halt. I'm so proud of her for getting back on that bike over and over again. Such bravery, such tenacity! "Now we can go on family bike rides!" she announced to Andrew when he came home from work (Duke students don't get Labour Day off, which we've come to accept as normal (after all, we survived how many years at BYU with no spring break? (I'd rather have no Labour Day than no spring break, if we're being honest here (which we are)))). "I think you're going to have to learn how to steer first," he said after watching her run off the road and onto a neighbour's lawn...and into a fire hydrant (the only obstacle in her path). "Well, yeah, but soon!" she cheered. "Because I can ride a bike now!" Now that she knows riding a bike is, perhaps, a little bit fun and not at all a form of torture, I think she'll be a lot more motivated to pull her bike out to practice than she was before. * I don't think Rachel ever successfully rode a tricycle for any considerable distance (though she does great on a two-wheeler). My kids just cannot do tricycles. I have fond memories of pedalling so fast that my feet couldn't keep up with the rotation of my front wheel, so I'd stop pedalling and put my feet to the sides, and let momentum carry me on and on and on. My children will have no such memories on a tricycle. Because they have all been terrible tricycle riders. TERRIBLE. Benjamin sits there, not moving his legs, and jerking his torso, making the tricycle inch forwards. And I'll stand by him coaching, "Move your feet! Push one foot down. Now the other." And he'll just say, "I can't." So at least Miriam was able to figure out that. And now she's conquered the two-wheeler as well. I laughed out loud. Those darn obstacles. Haha. Congrats to Meme! Ah, yes. David! You had the same trouble! I remember a neighbor's car and a fire hydrant!